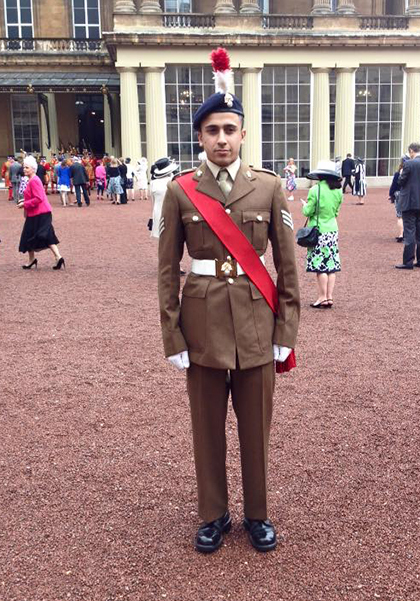 A student from The Sixth Form College, Solihull joined the Queen and the Duke of Edinburgh at a garden party at Buckingham Palace recently as part of his role with the Army Cadet Force (ACF). Malik Hussain has been in the Army Cadet Force since he was 13 years old and has risen to the level of Cadet Lord Lieutenant. Part of his role is to represent the adult Lord Lieutenant, who is appointed by Her Majesty the Queen, and this was how Malik was invited to the garden party at Buckingham Palace. “It was a very honourable moment in my life. I was able to see the Queen and I got as close as 5 metres to her and also to within 1 metre from the Duke of Edinburgh. Becoming Cadet Lord Lieutenant was a massive goal for me to achieve and getting this invitation felt like a wonderful reward for that achievement. Malik’s involvement with the Army Cadet Force has seen him twice completed a 12-mile walk for charity, completed his Bronze and Silver Duke of Edinburgh awards, qualify as an adult first aider and take part in a battle camp (training with the regular army on how life would be like when there is war). He has also had the opportunity to take part in community voluntary work, shooting competitions, orienteering competitions, athletics competitions, drill competitions and military skills competitions. Malik is currently studying A levels in Mathematics, ICT and Art. He hopes to pursue Architecture at University and is also considering whether to choose Army after university, with the possibility to attend Sandhurst after university to train as an officer.